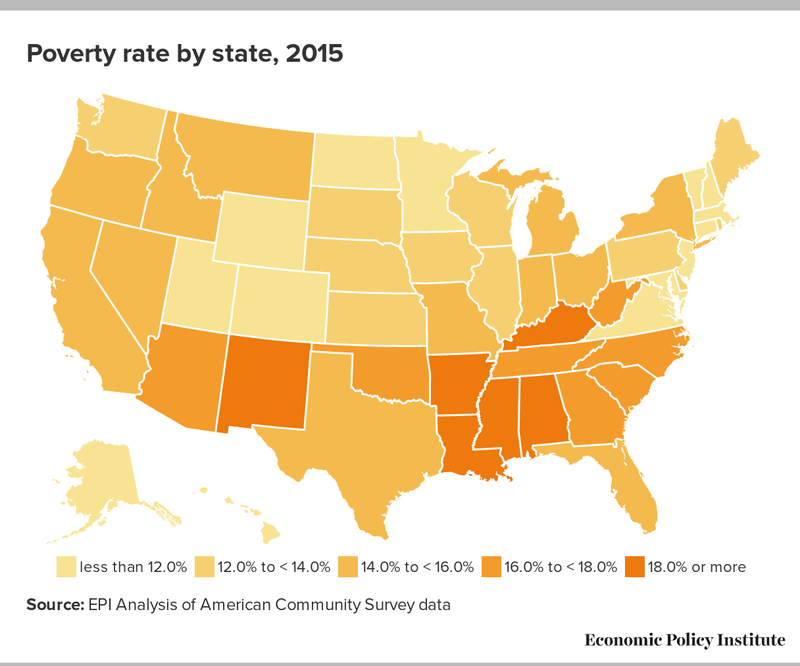 The poverty rate fell in many states between 2014 and 2015, according to this morning’s release of state poverty statistics from the American Community Survey (ACS). In 23 states, there were decreases in the poverty rate, with 6 states reaching their 2000 levels. 27 states and the District of Columbia saw no significant change in the poverty rate, and there were no states that had a statistically significant increase in their poverty rate. In 2015, the national poverty rate, as measured by the ACS , fell 0.8 percentage points, to 14.7 percent. (The ACS has a different sample, and thus slightly different estimates, than the Current Population Survey, which provided Tuesday’s national data.) Vermont saw the largest decline in its poverty rate (1.9 percentage points), followed by Tennessee (1.6 percentage point) and South Carolina (1.3 percentage point). The lowest poverty rates were in New Hampshire (8.2 percent) and Maryland (9.7 percent). While poverty did not rise in any state in 2015, there were still two states with poverty rates above 20 percent: New Mexico (20.4 percent) and Mississippi (22.0 percent). Widespread income growth at the national level, driven by improvements in labor market conditions, was key to the reduction of poverty across the states. At the same time, minimum wage increases in many states and cities boosted wages for many of the country’s lowest-paid workers. These factors, combined with the absence of any real inflation, provided a welcome reversal to the stagnation in wages and incomes that has prevented improvements in living standards since the late 1990s. Additionally, government programs, including Social Security, housing subsidies, and unemployment insurance, kept millions above the poverty line. While poverty remains far too high in virtually every state, today’s data suggest that many states are heading in the right direction.